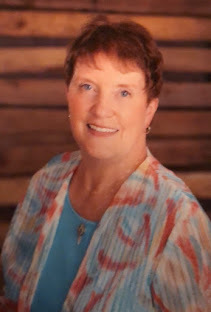 Journeys to Joy: Have You Read Julie Lessman's Books? Joy, I am chuckling because I didn't get to read Julie's books until I had a bought of illness and was in bed. Now I am hooked! And I am waiting anxiously for the next book like her other rabid fans, lol! JOY!!! HOLY COW, girl, you told me you were going to feature my books, but OH MY, what a review, my friend -- THANK YOU, THANK YOU!!! Mmm ... "rabid" is such an extreme word ... how 'bout "as passionate as the author"??? Uh, and as crazy??? You are THE BEST, my friend -- thanks for coming by! Saw this on my Facebook page and was curious. Definitely putting these on my wish list. They sound like they are right up my alley! Okay---I wasn't ill when I began reading Julie's books, but I was DEFINITELY OVERJOYED when I finished them! You're so right, Joy--Julie's characters DO come alive and live and breathe right off the page! Reading her books is like becoming part of a large and wonderfully warm family, with all its ups and downs and drama--only by being a "silent" part of that family, we get to live in the heads of each strong character, right along with Julie. Thank you, Julie, for Wonderfully Passionate books, and thank you, Joy, for telling the world! You already know just how much I love YOUR work, my friend, so your kind words are VERY precious to me -- thank you!! And I was SO thrilled when I saw that Amazon pegged your wonderful latest release, Promise Me This, as a suggested read for Downton Abbey fans -- WHOA, BABY, what a COOL promo, my friend, and SO deserved!! Are we going to have to start calling you Typhoid Julie?? LOL! What a spectacular review of all your books! I couldn't have said it better. Julie, you dig deep into the fabric of faith and romance and result?? You go, girlfriend. Keep writing! Joy I was the EXACT SAME WAY!!! Once I started reading I could not put the book down! Unfortunately (but fortunately!!) I started with A Hope Undaunted. I had read about three or four chapters in and I decided to go online to see if the new-to-me author had more books!! AND SHE DID!! I can't wait for her Julie's next release!! Ladies - you are each entered in the drawing for ONE of Julie's books - including the one to be released. Someone is going to be made very happy by receiving the book they choose. My DH will be doing the actual drawing. I've left a comment - can I pretty please be in the drawing too? Just kidding - I will GLADLY buy the next book - and the next and the next and the - well you get the idea! Come back again ladies - I'll be happy to see you any time! Thanks for the heads up about Julie's books. I will give them a try. I haven't read any of Julie's books yet, but I am anxious to! 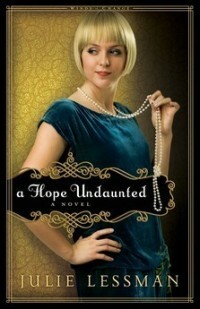 I have a copy of "A Hope Undaunted" but I am waiting to get the first book before I read it. I would love a copy of "A Passion Most Pure". I just recently read APMP and LOVED it! I had to immediately get APR and now I'm waiting on APD to come in at the library :) I put off reading the first book, even though Julie sent it to me WAY back. That was a DUMB DUMB mistake on my part. Never again will I put off reading a Julie Lessman book!!! LOL, AUDRA ... I hope not, although one might get home"sick" after reading about the O'Connors since they are SUCH a close family!! Thanks for swinging by, my sweet friend -- it always blesses the socks off of me when a Seeker bud comes by. UNKNOWN ... Nooooooooooooo!!!! You started with AHU??? WAIT ... are you that sweet gal who started reading AHU, then immediately put it down to buy the others first so you could read them in order???? If so, you deserve to win for your intelligence (and kindness) alone, girl, so GOOD LUCK in this contest!! SHERRI!!! WOW, another stellar review -- thank you SO much, girl!! And, YES, please DO check out the other books in the series because you just HAVE to see how Charity redeems herself, right?? And book 1 of the Winds of Change series is my FAVE of all the books I've written and won Booklists's top ten Inspirational Fiction for 2010 AND Family Fiction Magazine's Series of the Year, so if you only have time to read one, you may want to read that one. Good luck in the contest!! JOY ISLEY ... YAY, soooo glad Joy convinced you, girl, so here's to a win in this contest so we can get this ball rollin', right?? GWEN!!! Still can't believe you haven't read one of my books yet, girlfriend, but I do appreciate your diligence in reading the books in order. We are going to have to get APMP in your hands soon, I can see that. And if you don't win here, there will be another chance with my Seeker blog next week, so GOOD LUCK!! ANNE!!! LOL ... you are SO cute!!! Took you long enough to read 'em, but boy, oh boy, you don't let any grass grow under your feet since, do you?? I think you will like APD because that's where I really began the "sub stories" that are such a part of the second series, and Marcy and Patrick have a sub story that I absolutely LOVE, so I hope you do too! JULIE - I am anxious to get APD read because I already have the first two in The Winds of Change series on my Kindle!!! And honestly...October can't come soon enough :) Waiting out the "heat" of summer ;) Your new book is going to make for the best beginning to autumn in these foothills! 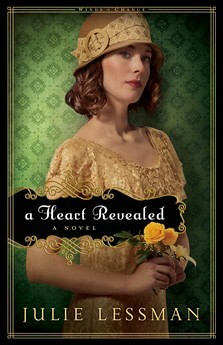 I have to agree her books are AMAZING I am reading A Heart Revealed right now! I am lucky I don't have to work until later today since I stayed up way to late last night reading! Thanks Julie for blessing us with your books! Oh Julie, I so agree about everything Joy said about your books!!! They may be fiction but they seem so real as if while reading, you were sitting down to dinner with the O’Connor’s, seeing their struggles and joys firsthand. I can’t say enough good things about your books, my friend! LOL, ANNE, you SO bless the socks off of me, girl -- THANK YOU for coming by to encourage me, my friend. You are a blessing!! JOELLE!!! Gosh, I am SO sorry I caused you to lose sleep ... NOT!! ;) Actually, I am because I don't want you to be too tired at work, so if you get sleepy, just think about one of the love scenes you read and hopefully that will wake you back up ... ;) Thank you, Jo, not only for reading my books, but taking the time to come by and comment. Here's hoping it nets you a win!! AMANDA!!! Guess what I was reading RIGHT BEFORE I came to Joy's blog!! You guessed it, sweetie, and I was reading it on my OWN WRITING TIME, which almost NEVER happens!! It's only happened a few times before with one of Tamera Alexander's books and one of Kristin Heitzmann's novels, so that will show you how much I love it. Will get back to you soon, my friend, and THANK YOU for coming by!! Thank you for writing such beautiful and positive stories! Julie's books are fantastic and I'm on pins and needles waiting for A Love Surrendered! I have only read one of the books but I did enjoy it greatly. So looking forward to reading the new book! So many spiritual truths hidden in a wonderfully written romance story with some supense. That's Julie Lessman! I anxiously await each of Julie's new releases! I finished A Heart Revealed earlier this year and I know I ran across a preview of the upcoming release somewhere, so it's definitely on my wish list! Julie's books are wonderful! Full of compelling characters, gripping stories and (of course!) passionate embraces that make a reader weak in the knees! I'm glad you're getting the recognition you deserve, Julie! Wonderful review! I have read one so far in this series and love it! now I'm convinced I must read the rest. Everything that Joy said is so true. They are the BEST BOOKS EVER! I came upon Julie's first book at my town library. Since then I have been reading her books. Once I start reading them I don't want to put them down!!!!!!! LIZ, believe it or not, I'm on pins and needles too, because I hope you like ALS as much as I do. I went through 30 Kleenex editing this baby, and until it, my all-time high was 12!! ;) So hopefully you will laugh a little and cry a lot in this final episode of the O'Connors. :| Thanks for stopping by and good luck in the contest! WYN!!! Only one, girlfriend?? Well, we need to get another one in your hands, pronto, eh? GOOD LUCK in the contest!! LINDA!!! Always LOVE seeing your sweet name in the comments, my friend. Thanks for coming by to support me as always. Joy, great review, you did an a great job at highlighting theses wonderful books, hopefully everyone that has not read them will now go out and buy them all!!!! Oh, Julie, of course you know I am a huge fan of your books and can not wait for more to read from you. You truly are an amazing and talented writer! I'm sorry you had to be in so much pain from your back, but Julie's books are wonderful distractions. I've read all her books (though I don't own them all, unfortunately) and am looking forward to A Love Surrendered and the prequel telling Patrick and Marcy's story. I'm happy that Julie decided to do the prequel as well. One of the things I love about Julie's books is that the characters are not only passionate for each other but passionate for Christ. They are not perfect people but allow Christ to redeem them and strive to live for Him. They are books of hope for the rest of us. Pam - I don't think it was a coincidence that I was laid out on my back for those three or four days. I'd not had muscle spasms since 1995 right after a big back surgery. I was so glad AFTER reading all five books in a row - it was worth the pain. Thank you for reiterating the Spiritual message part of Julie's books - you are so right - her characters are like real people - IMPERFECT - after all if we were perfect we'd not be here to have to grow any longer. ;) Thanks, so much for stopping by and commenting on Julie's wonderful work! Wow! I agree! Julie's books are TOTALLY AWESOME!!! I LOVE THEM!! I'm so glad that you had some great reading material to get you through your days of pain. I can't wait until her next book is released! As soon as it's out, I'm getting it for my KINDLE!! Hey, PATTY, you probably saw the preview of A Love Surrendered either in my newsletter or my Journal Jots blog, so thanks for reading it, girl. Hopefully we can grant your "wish" here for a win!! Good luck!! KAYLA!!! Every time I see your name in a comment, I smile because of the "Julie Lessman Fan" as part of your addy. You are TOO cute, sweetie -- LOVE IT and love YOU!! Julie's books have been on my to buy list for a while. Thank you for sharing. Oh, you bet, girlfriend, because without Christ, there would be no changed Julie Lessman and no books. Heck, without Christ, there wouldn't be ANY Julie "LESSMAN" because my husband wouldn't have looked twice at me since it was my Christianity that caught his eye. So, YES, passion for Christ is KEY in my books!! CECILIA!!! Hey, how the heck are you, my friend, and will we see you at ACFW this year, I hope?? PLEASE say yes, okay? CHRISTINA!!! Oh, man, girlfriend, we gotta get one of these books in your hands, truly. Put 'em on hold at the library, beg, borrow or steal, but read one so you can tell me what you think, okay? Or maybe you'll win in this contest or my giveaway in Seekerville next week. Either way, GOOD LUCK in the contest!! I agree Joy, Julie's books are simply masterpieces! I hope you feel better soon. I'm doing so much better - even went for a walk this evening while it was still warm. I'm working like crazy on my own book and wouldn't be doing that if I felt like I did last week. Thank you for stopping by. Late to party....been in another town to see hub's heart doctor...good report but very expensive drugs! Seriously, Joy, I don't mean to be a copy cat...but I was mostly on the couch on my back due to sciatica pain and read both AHU and AHR!! Helped me forget the pain! Love Julie's books...so passionate, inspirational, and wonderful! I can't wait to read A Love Surrendered and would choose that one IF I win this drawing! I hope I won't be ill then; but if so, worth it to read her book! Thanks!!! Hey, RENEE, SO good to see you here, girl!! Masterpieces?? Well, I'm not sure about that, but they are full of drama, angst and passion, I'll give it that! Thanks for coming by, sweetie. JOY!!! Sooo glad you are on the mend, girlfriend, and back at writing!! You go, girl!! JACKIE ... YAY on the good report, boo on the expensive drugs!! And, LOL ... you were sick, too, reading my books??? Okay, now I really AM getting a complex. ;) But I'm glad you could forget about your pain by focusing on the pain I put the O'Connors through! :) Good luck in the contest, my friend! What a great review of a wonderful book and author! I have read several of Julie's books and love every one of them. As soon as I finish one I go looking for another. In my opinion she can't write fast enough! I run the library for my church an the "Daughters of Boston" are very popular. Just purchased the first two in the new series, cant wait for the third, im sure it will be as popular! First time visitor here, Mrs. Melville, but you have a lovely blog! So sorry to hear that you were in so much pain, but I'm glad you were able to read Ms. Julie's books --I agree with every word you wrote-- they're wonderful! I've got to try a marathon read-through of the series someday ... maybe this summer. Incredible review! Wow! I guess I better get a copy of these. :) Thanks for sharing. Great review! Makes one want to run right out and buy up all of Julie's books! I definitely will be adding to my list of books to read! I would love to win...but don't we all?! Blessings and Happy Easter! Our LORD IS RISEN! I also wasn't sick when I first read Julie's books. But I might as well have been. I didn't get anything done until I finished all of them. My opinion is there the best Christian romance out there. I can't wait to read Love Surrendered. Every one of them I have read in one or two days! I get so caught up in them I feel like I am right there with the O'Connors. I cant wait to read Steven's story. His is the only one I haven't read yet. LYNNE, LOL!!! In my opinion, I can't write fast enough, either!! Which is why my new series will be about a 100 to 150 pages shorter per book than my O'Connor series ... so I can get them out every nine months instead of every twelve. :) Thanks for reading my books, Lynne, and for your sweet comment -- GOOD LUCK!! LDK, YES!!! I can hardly believe ALS is only &7.72 on pre-order, so go for it, girl, because I have NO idea how long it will be half price, but I can't imagine it will be too awfully long, you know? PEGG, YES!!! Please do, sweetie, but if you do, PLEASE start with book 1 of the Daughters of Boston series as these are two series (and one BIG family saga) best read in order due to a number of big surprises in book 1. And APMP won American Christian Fiction Writers Debut Book of the Year for 2009, so it's a very good one to start with. Good luck in the contest, and if you win, I will be happy to send you APMP. JUDY, thank you SO much for adding my books to your TBR list -- MUCH appreciated. But as I told Pegg above, PLEASE start with book 1 of the Daughters of Boston series as these are two series (and one BIG family saga) best read in order due to a number of big surprises in book 1. Good luck in the contest, and if you win, I will be happy to send you APMP. LOL, TAMERA!!! Soooo glad to hear you weren't sick when you read my books, but that is too cute about you may as well been. And, WOW, the "best Christian romance out there??" Honey, I just KNEW I loved you!! Thanks, Tamera -- you are THE BEST!! LEAH ... "One or two days"??? WOW, girl, you are a speed reader for sure. Kinda makes me wish I were a speed writer, you know??? Thanks for coming by, my friend, and good luck in the contest!! Here's a sneak peek of my favorite only one I've read!! Know I would enjoy allllll of the rest of them!! Two series!! What a beautiful review! I'm so sorry for your pain, I'm glad you were able to find a bit of relief and escape in the O'Connor's world. Very uplifting! I love your Winds of Change series but need to read The Daughters of Boston Series to keep up with O'Connor family. I agree with Joy that Julie's books are awesome. I've only read one of Julie's books and I am hooked!! I can't wait for this one to come out. With Julie's books, you can't read just one! They are that good! Joy...what an inspirational story...and posting. KATHLEEN!!! LOVE that review, my friend, because like you, I love ALL things Irish, and you certainly fit that criteria!! Here's to a win, girl, with the very last book in this Irish family saga!! JULIA ... Soooo nice to "see" you again, girlfriend. That must mean you have a little more free time on your hands lately, which is good. Always nice to take a breather, right? BRENDA, YES!!! You DO need to read the Daughters of Boston to see how it all started. I guarantee you there are enough thrills, chills and angst to keep you from getting bored despite the fact you already know how some things end. Reserve them at the library if you must, but READ them, okay?? And maybe you will win here to kick that series off, eh? JOY ... GOTTA get you another one of these books, girl. I hope it was A Passion Most Pure you read -- I can't remember!! But if you didn't hate Charity too much in THAT book, then you could be in for a treat with her story because Mitch is SO hubba-hubba, and Charity is absolutely one of my faves to write about, so I hope you enjoy it. That story, A Passion Redeemed, is my fave of the DOB series, then A Hope Undaunted is my overall fave. Good luck, sweetie. KAREN!!! Wouldn't be the same without you here, girl, so thanks for coming by and Sean and Emma are WAITING for you, my friend, so let's put it on hold at the library or beg, borrow or steal, okay? It was on sale on Kindle a few weeks ago for about $2.99, and you do NOT need a Kindle to read it. You can download it to ANYTHING pert near, even a PC. Of course, that's a bit tough to read in bed, unless it's a laptop, you know??? ;) Good luck, my friend. Hey, ROSE, if I seem to have a "following," it's only because my reader friends appear to be as "passionate" about romance as I am!! So you have read A Passion Most Pure and A Passion Redeemed?? A lot of people have told me that the final book in that series, A Passion Denied, is the best of the three. All I know is that it's the only one of my five books that has a full five starred rating on Amazon. And there is a sub plot in there for Marcy and Patrick that rips my heart out because it's actually based on something in my marriage, so it's a powerful story. And that's just THEIR subplot. Brady and Lizzie's story is probably my most favorite spiritually, so all in all, APD is a good bet. This has been so fun - never saw so many JOY'S in one place - have you, Julie? I love that I was able to bring you all together over at journeystojoy - be sure to tell your friends about this party we're having with Julie. Hugs-a-mighty for sharing your hearts with me this week! My daughter is an avid fan of Julie's and historical romances. I would love to win Julie's newest book for her! Thanks for the great review and the opportunity to win the drawing. Julie, I already have A Passion Denied and it is moving up in my TBR pile after your recommendation! Your new series sounds great, too! Keep em coming! I just need more time to read! Now that I am writing too, the reading time is limited, but I know I need to read great books to write great books! JOY ... no, I haven't!! Lots of Joys spreading the "joy," eh?? Thanks again, Joy, for such a great promo!! SUSIEQ ... Now here's a mom for you!! Surfing the web for giveaways for her daughter -- you ROCK, Suz!!! And may I assume you are either not a reader or not a romance reader?? If so, I have a sister-in-law who reads NOTHING but blood and guts and only read my first book to be nice. Turns out she LOVED it and now devours each one when they come out. Says I'm the ONLY romance author she reads because it's so much more than just a romance. A family saga brimming with LOTS of drama, angst and ... ahem ... PASSION, both romantically and spiritually. If you ever get me a try, let me know, okay? OH how I could have used a Julie Lessman book today - had an attack unlike any I've had in many years - had to cancel a dr appointment - AND - a much-sought-after research resource appointment. Not sure what bothered me more - not having one of Julie's books to read, the attack itself - OR - missing out on that resource I'd been trying forever to reach. Julie's October release - I SURE WISH I'D HAD THAT TODAY! Julie's books have been on my "to read" list and now I know I want to read them! What a wonderful post, Joy. Your heart is precious and you have such a gift of encouragement! Julie's books have been on my wish list. There are several books that I find that I like to read at once and this is one batch that I do. I LOVE all of Julie's books, and LOVE Julie just as much!! I canNOT wait for Stephen's story to come out!!! That's the one I'd want if I win - to complete my set of course!! :-D Love you, Julie! JO!!! Did you ever read the copy of A Passion Most Pure you won, because your comment above sounds like you might not have read any of my books before, but I know I sent you that one. If you haven't read it, make sure you do before you get your copy of A Love Surrendered, which is the book that will have your name in it as a subordinate character. ALS is the sixth book in this family saga, so it's really best to read them in order, but if you read APMP, you should be okay because that lays groundwork for the series PLUS has two big surprises in it that would be ruined if read out of order, okay? Good luck!! ALLI!!!!! Girlfriend, long time no, see or hear or whatever!! Hope things are going well for you and your family and I hope you like Steven's story as much as I do!! Good luck, my friend and HAPPY EASTER!! Julie - if it makes you feel ANY better - I tried reading Sean and Emma's story when I was sort of bedridden but I was on hydrocodone and needed lighter fare... had to wait till I was healthy again to read it ;). Love you, dear friend! Can't wait for Steven's story - OR Patrick and Marcy's! LOL, CAROL, YES, actually it does because when you read my books, I don't want you on any drugs -- I want you to FEEL the angst and drama to the point of tears or laughter!! Awesome! I still haven't read any of Julie's books, but I'm really looking forward to reading them... they look great! Julie's books look amazing! I've heard such great things about them, so I look forward to reading them somewhere down the road. Thanks for the giveaway! Great giveaway! I'm entering for my daughter... she would love Julie's books! Julie, you are the best. I just love your books and love you as a person. Enthusiasm and graciousness all in the same package. Love the cover of A Love Surrendered. Joy, so glad you had Julie visit here. I'm just about to start reading the first one in the serious! Can't wait!!! I'd love to have the second one, so I don't have to wait for it!! Thanks so much for the giveaway! I'm so excited! Please enter me into the drawing! Never read any of Julie's books, but I've been meaning to start the first one for some time now. Everyone says they're so good! Please enter me in this giveaway...even though I feel like the odd man here! lol! John - no need to feel odd - there is so much of the male view point in Julie's books you'll soon feel right at home. Thanks for checking out the review - and if you haven't begun the series - be sure to start with A PASSION MOST PURE and move on from there. Jillian Kent - you sweetie - welcome back to my blog. Her books have inspired me as a person and a writer. When do I get to review another Ravensmoore Chronicle? Julie is awesome! Almost - I said ALMOST - wishing I could be laid up in bed for a few days so I had time to get through all the books! I'm going to join the "not reading the books until you're sick ongoing joke" as I've got pneumonia and about all I can do right now is read. Seriously, I've not read this author and would really like to. JENNY ... I am THRILLED you have heard "great" things about my books, but that could be because I have absolutely some of the most PASSIONATE readers that I (AND my publisher!!) have ever seen, which is good because I am VERY passionate about God and romance, so buckle up, girl, and GOOD LUCK!! I suggest you have tissues near at hand - be prepared to laugh your lungs clear AND by all means have your robe on - cause you're in for ONE WILD RIDE! EnJOY - these are incomparable! DEBBIE!!! Listen to them, girl!! All those people who are telling you they are good -- they sound trustworthy to me!! :) Seriously, check out some of the reviews on Amazon -- they are PRETTY passionate, which is because passionate readers like passionate reading, which is what I am all about -- both in my passion for God AND romance. So, good luck in this contest!! KATE, HAPPY BIRTHDAY!!! What an absolutely FABULOUS day to be born, although I know it's not always Easter on your birthday. :) Here's to a win, my friend -- GOOD LUCK!! JOY, you are going to love, love, LOVE Jill's next book -- it is WONDERFUL!! CAROLYN ... I am SO sorry to hear about the pneumonia and am saying one RIGHT NOW for supernatural healing from the throne of God, girl. And I LOVE new readers because I LOVE seeing people fall in love with the O'Connors. They are EVERYTHING a family should be -- fun, dramatic, passionate and tight-knit. I hope you get to meet them soon, my friend. God bless and HAPPY EASTER!! I completely agree - Julie's characters stay with you long after you've read the stories. It has been a while since I've read each of her five books and I'm almost ready to read them again. Can't wait until Steven's story is released. Love, love, love her writing. I don't have a blog or facebook so I thought I'd post my comment anonymously!! My name is Jacinta Rose Swindell and I love the fact that I share Katie's middle name!! I've read all of Julie's books and LOVE them!!!!! My favorite would have to be A Passion Most Pure! I totally love Collin and I want to be a writer like Faith! I've already pre-ordered Steven's story but I can't wait!!! Keep up the good work Julie!!! Hey, KATHY, thank you SO much, my friend, for your sweet comment -- MUCH appreciated!! Hope you had a WONDERFUL Easter, Kath, and good luck in the contest! I absolutely love Julie's books! I would like to be in this contest thanks! Thanks for coming by, Jacinta, and GOOD LUCK in the contest!! WHOOPS, TAMARA, you snuck in on me with that comment, girl, but I'm glad you came by to enter the contest. Thanks for your kind words and here's to a win. GOOD LUCK!! Love Julie's books! She has such a passion for God and it clearly shines through in all her book! Thanks, Julie! Hey, SANDY, thank you SO much for your kind comment, my friend -- it blesses me because if there is one thing I definitely want to shine through in my writing, it's my PASSION for God, so THANK YOU!! GOOD LUCK in the contest, girl!! But Jules, you know I'm behind you and JUST plainly love you, huh? But just in case : Love you, Jules! Hope you'll not get tired of hearing that. This has to have been the most exciting review and response week I've had on my blog. I've enjoyed reading the comments from so many who are long followers of Julie - it's given me more insight into the person I believed her to be - WHOLESOMELY GENEROUS and FUN LOVING and PASSIONATE! Thank You Julie for coming to my blog - even though I'd not asked you to do that and to offer the gift of one of your wonderful books - well - like I said - GENEROUS! I LOVE YOU TO PIECES - COME BACK SOON! 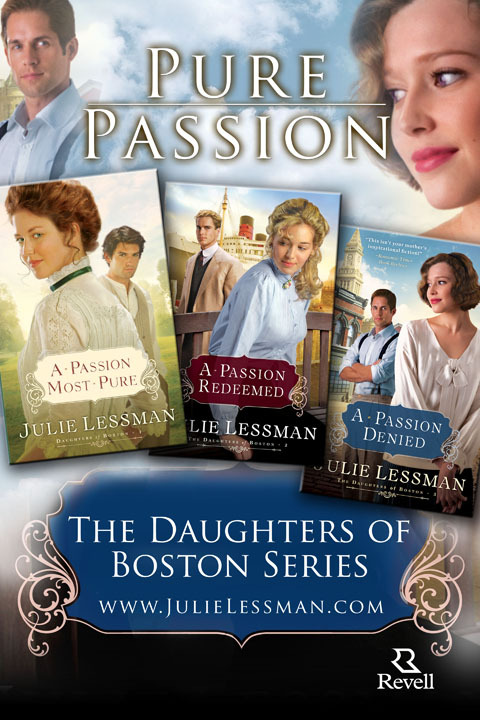 If you do read my books, PLEASE begin with book 1 in the Daughters of Boston series, A Passion Most Pure, as this is one series best read in order, okay? Thanks for coming by, and if you don't win here, I have another giveaway on Wednesday at my group blog, Seekerville, so check out my website calendar for the link. JOY, it was a blast and for you??? Anytime, darlin'!! Have a great week and happy reading (and writing and blogging)! Love you to pieces right back! !